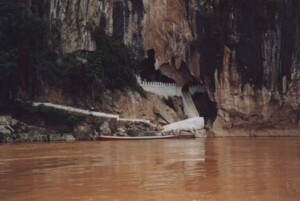 Pak Ou caves are in the rocky walls of the sandstone mountains at the confluence of the Nam Ou river and the Mekong. There are two caves . The lower and smaller, Tham Ting “mostly known as Pak Ou Cave”, is open to the light some 50ft above the river; but the higher cave, Tham Phum, is deep and impenetrably black without a torch. 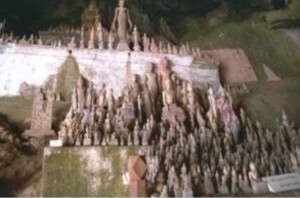 Pak Ou caves contain 2,500 Buddha images made from wood and gold. Some are over 300 years old.